A massive squat site at the abandoned Tuffy Habib factory in Rio de Janeiro's Alemao slum complex. RIO DE JANEIRO, Brazil — They call it an invasion. In the early hours of March 23, hundreds of people from this city’s massive Alemao complex of shantytowns streamed into a closed-down factory on one of the slum’s main streets. They’re sheltering in squalid, ramshackle partitions hastily erected on the factory’s two floors. The people living here, who identify with the "Sem Teto" (literally “Roofless”) movement, say they have no choice. In Rio de Janeiro, a state government-run “pacification” program has sought to free the sprawling city’s hundreds of favelas from the grip of organized crime. It’s had some success. But with “peace” and progress have come spiraling real estate and rents. Now, across Rio and other Brazilian megacities, the country’s lowest wage earners are finding themselves priced out of what were once the poorest neighborhoods, known as favelas. Residents of the Alemao complex said rents have tripled there in the last two years, leaving workers with a stark choice. The standoff in the favela could rile poor voters, putting pressure on President Dilma Rousseff, who’s gunning for re-election in a second-round vote on Oct. 26 that’s expected to be very close. She and her predecessor launched policies that are widely praised for lifting millions of Brazilians out of poverty. But Nova Tuffy residents give the sense that they’ve missed the lift. 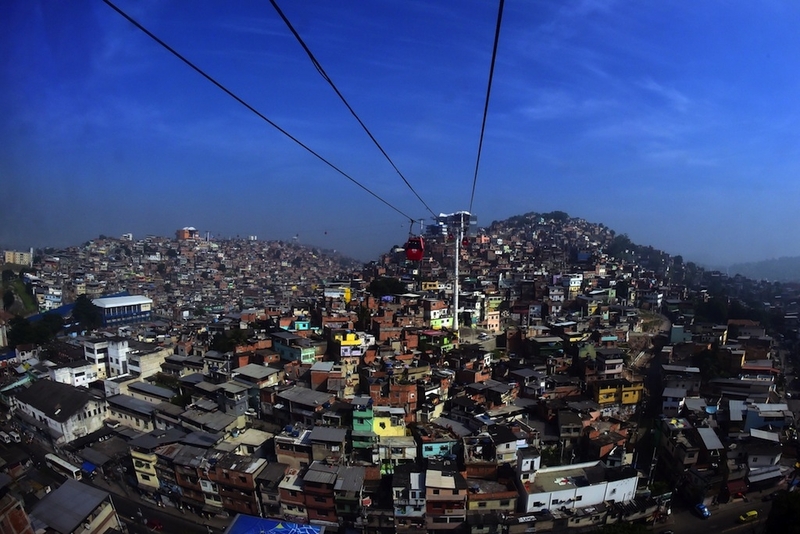 Rio’s rickety favelas — several of which overhang prime real estate — grew organically as the city’s population swelled in the 1970s, '80s and '90s. By 2010, nearly a quarter of Rio’s 6.3 million people lived in favelas, according to Brazil’s national statistics institute. The Rio state government set up the first Pacifying Police Unit (UPP) in late 2008 in southern Rio’s Botafogo neighborhood. 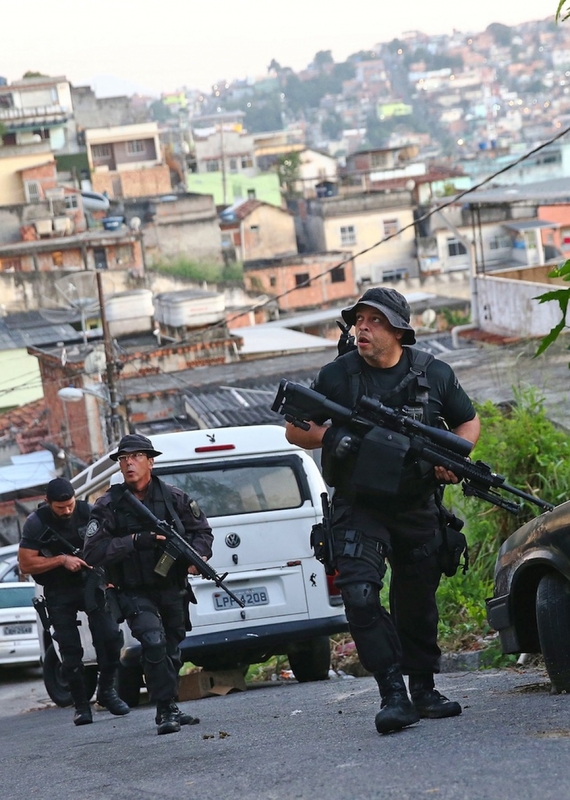 The pacification effort ramped up in the months leading to this year’s World Cup, with specially trained military police units moving in first to clear out known traffickers before the UPP cops set up base. As of September, 36 UPP outposts were policing Rio’s favelas. But it’s not just crime that’s overflowing from the supposedly pacified shanties. Some slums in Rio’s south have recently seen an unprecedented real estate boom and bidding wars for land. As the favelas have become safer, they’ve become more attractive to middle-income Brazilians who themselves are being priced out of higher-end neighborhoods. “Rent has increased but the salaries are the same,” said 27-year-old Junio Roberto Souza, a Nova Tuffy resident. In Rocinha, on Rio’s south side, families said they were struggling to pay their rent each month. Another sprawling slum complex called Mare, not far from Alemao, is undergoing the first stages of “pacification,” which has produced gunfights. As a military police helicopter flew overhead, residents said rent was already spiking. Add increasing rents to other rising consumer prices — in September, Brazil’s annual inflation rate hit a nearly three-year high of 6.75 percent — and you have all the ingredients for an invasion like the one at the Nova Tuffy factory. The horrors of Nova Tuffy don’t become apparent until you enter the bowels of the building. In the dazzling Rio sunshine above ground, the factory is a shambolic and dirty spectacle, but it’s still full of the smiles and sights you see just down the street in poor residential neighborhoods. Underground, it’s a different story. Here, where the very poorest of the slum dwellers live, the air is rank and musty with the stench of open sewers. The light quickly fades as one moves deeper into the building, but even in the darkest corners there are shacks — “barracas” — from which children emerge, blinking. The residents of Nova Tuffy appear to follow a hierarchy. A president and vice president occupy larger, cleaner spaces on the factory’s second floor. A few weeks ago, an official from the city’s Public Works Department visited Nova Tuffy and assured residents that someone would be back to conduct a survey — the first step in getting them cheap public housing provided by Brazil’s federal My House, My Life program. He’s still waiting for Rio’s governor to order officials to enforce the judgment. Similar invasions in Rio and in Sao Paulo, Brazil’s most populous city, have ended in violence. Just last month, military police raided an abandoned Sao Paulo hotel taken over by 800 squatters. The officers fired tear gas and stun grenades, and arrested 80 people. A similar story played out in March in Rio’s Engenho Nova neighborhood, where local media reported 5,000 people had invaded a large building. About 1,700 police officers stormed the squat, and rioters responded, turning the streets into a war zone of burning buses and tear gas. Sixteen people were injured in the police operation. Kids chased each other in an open area outside while a woman preached through a tinny microphone across the stretched tarps of the huts. Young men enjoyed an early beer at one of the impromptu stalls at the factory’s entrance. The smell of cooking rice and beans wafted from a nearby hut where a grandmother made a meal for her family. Despite the residents’ grand hopes for a government intervention that ends with housing for their families, many of the residents here are simply fearful for the day when police battering rams start knocking down the factory’s doors.